Go mobile with the Bop It! Micro Series game! This compact version of the classic Bop It! game is just like the game you already know. Choose from Solo or Pass It modes and move fast to keep up with the action commands. Twist it, Bop it, and Pull it in the sequence the game tells you to! 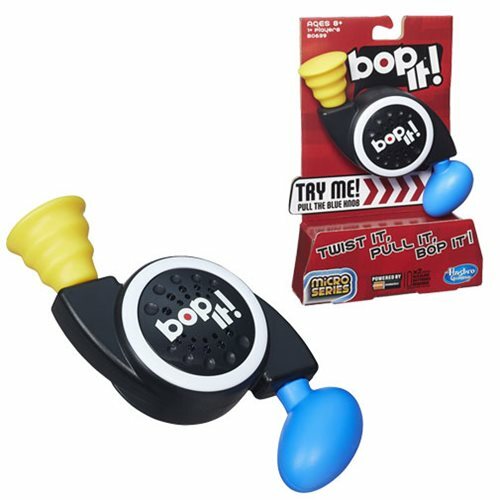 Play against yourself or play with friends, but either way the Bop It! Action with this Micro Series game is going to be epic! Measures approximately 6 1/2-inches long. Requires 2x "AAA" batteries, included. Ages 8 and up. 1 or more players.